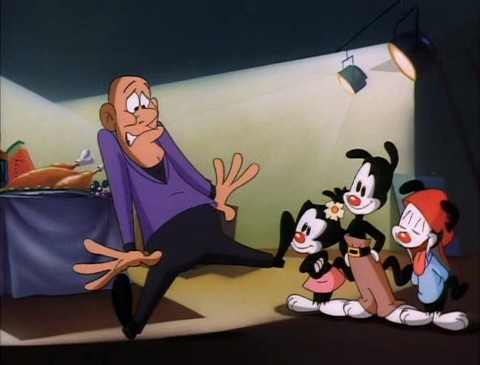 Yesterday, it was announced that the fourth and final volume of “Animaniacs” will finally hit DVD, arriving on store shelves (or Amazon.com) February 5th. After feeling like it would never be released (or if so, it’d be straight to a Warner Archive release), I’m glad to finally see “Animaniacs”‘s run finally completed for DVD. It’ll now join its spinoff show “Pinky and the Brain,” which also completed its DVD release awhile ago, and the also recent announcement that a volume 3 of “Tiny Toon Adventures” will be released to DVD. A fourth and final volume of “Tiny Toon Adventures,” which’d complete the regular series’ run and (likely) the few TV specials that were made (including a rarely-seen “spring break” special). “Taz-Mania,” the Tasmanian Devil’s early 90s series, hasn’t appeared at all on DVD (or on TV in years), save a few episodes on a PAL DVD release in Europe. “Histeria!” is completely unavailable on DVD. I suspect it being an early “E/I” educational show production might make its chances of a DVD release extremely unlikely (save maybe via the Warner Archive program). “Sylvester and Tweety Mysteries” saw a first volume of 13 episodes released to a DVD set several years ago, but nothing since. At 13 episodes per set, it’d need another three sets to finish its run. “Mucha Lucha!”: Despite being TV’s first series produced in Flash animation (unleashing a wave of Flash-animated series dominating the airwaves since), the show’s only had a few episodes released to a single DVD, plus a direct-to-DVD movie. “Static Shock”: Despite the show’s popularity (and often airing through the 2000s on cable), there’s only a single DVD release of a few episodes available. “Detention”: A short-lived 13-episode late 90s cartoon that was mostly a knockoff of “Recess,” about a group of goofy kids and their dictator-like teacher. It hasn’t appeared anywhere on home video to my knowledge. “Ozzy & Drix”: A spinoff of the movie “Osmosis Jones,” this series aired for 26 episodes across two seasons. It hasn’t appeared on DVD. “Coconut Fred’s Fruit Salad Island”: Despite being (in my opinion) one of the worst cartoons ever made, this show’s yet to appear on DVD. “Waynehead”: an early Kids’ WB series loosely based on the childhood of Damon Wayans, this show ran for 13 episodes. “Jackie Chan Adventures” has an odd release to home video. On DVD, it’s available as several single discs (collecting the first 13 episodes), while Amazon is selling the second season’s worth of episodes (of 39 episodes) on a burn-to-DVD-R release. Its first season’s run is available as a complete set only in region 2 (the UK). The show’s entire run, however, is available on iTunes, Amazon Instant, and Netflix. “Johnny Test”: the first 65 episodes of the show are available on DVD, while the first 91 episodes available are available on Netflix. “Road Rovers”: a short-lived 13-episode series about crime-fighting dogs. While it hasn’t appeared on DVD, it does have some lingering popularity, so I could see a release made (even if via Warner Archive). “The Legion of Super-Heroes” has seen its first season collected on DVD, but the rest has yet to appear. “The Zeta Project,” a spinoff of “Batman Beyond,” has its first season collected to DVD, but not its second. “Xiaolin Showdown” is available on DVD for only its first season. That’s a lot more shows than I figured. While Netflix, iTunes, and Amazon Instant have helped for a lot of the above, I’m sure there’s fans of all of these shows who’d love to see these shows on DVD. Perhaps this could be a job for the Warner Archive service?